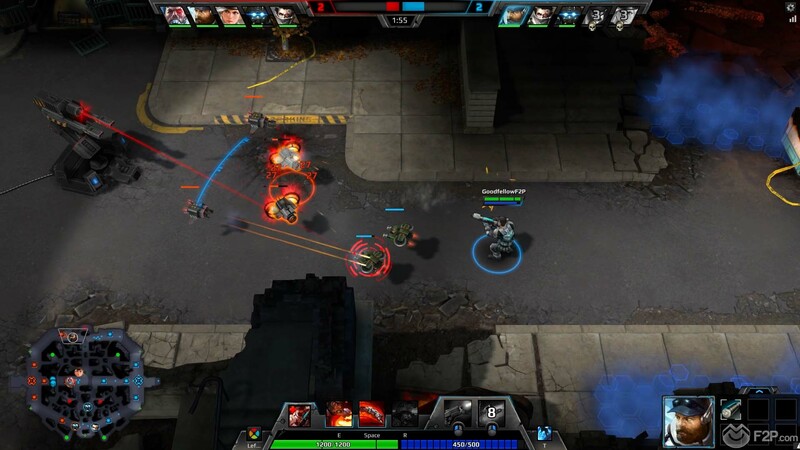 We recently got the chance to check out the new MOBA from BigPoint, Shards of War, a futuristic twist on the popular genre where players must fight in teams of five in a lane pushing, base destroying action packed battle. The game is currently in closed beta and upon release will be completely free to play with a variety of premium currency options. 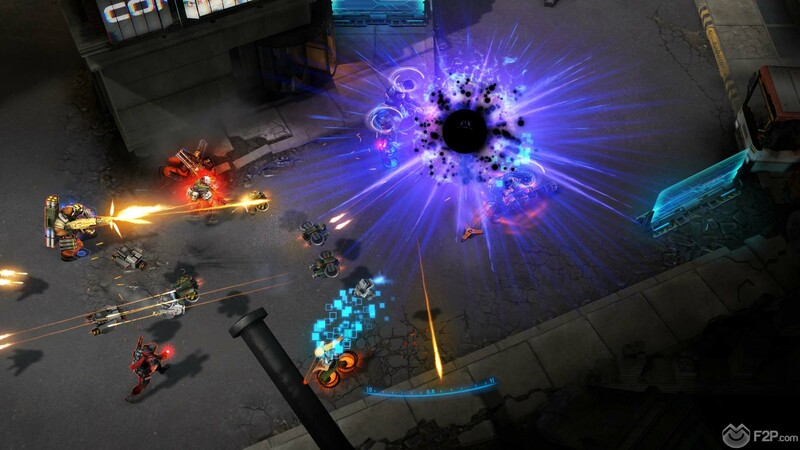 Our first actual look was the tutorial, which essentially portals in a 5v5 battle with a bunch of AI bots, however are recorded First Look was essentially the same game as there are currently no players online as the game is only just become accessible. 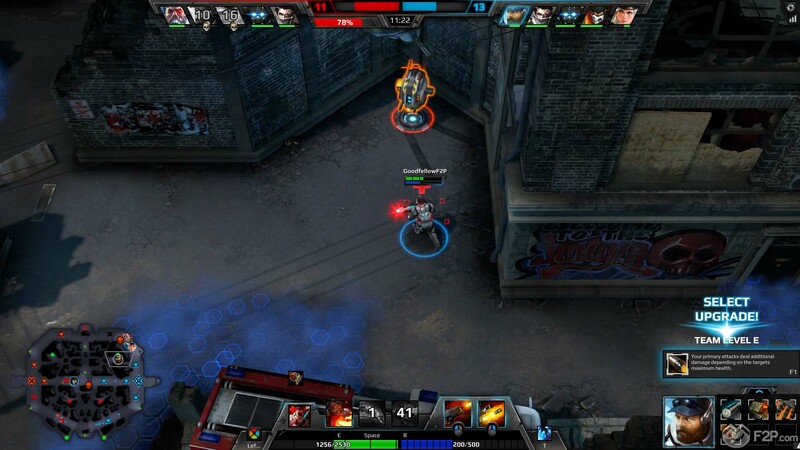 Fighting on the Empire City map (and whilst there are mention of three different Shards we’re not entirely sure whether these are all accessible through the same gameplay mode at this stage) we tried out the attacker role Sentinel: Striker. 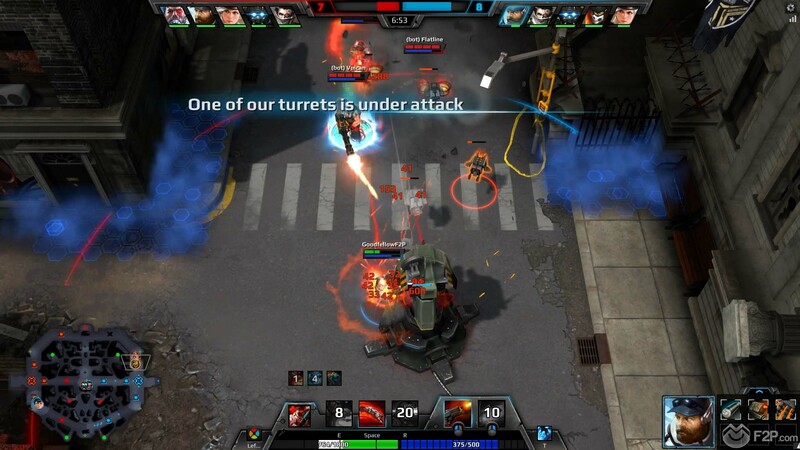 As you would expect Striker is a pretty heavy damage dealing fighter who is able to throw grenades, on leash powerful automatic barrages from his rifle as well as a few other nifty moves. 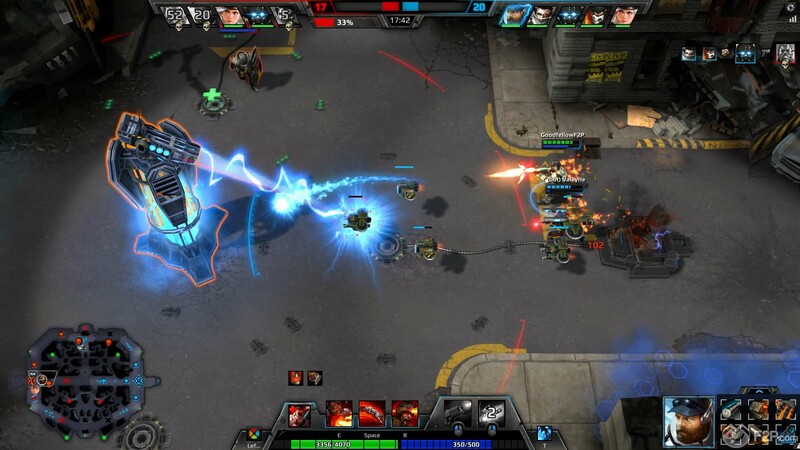 As players who are relatively novice to the MOBA genre we have to give a tip of the hat to the WASD controls allows to move a character around being this free to aim with the mouse independently, it feels considerably more intuitive and easy to control allowing for some run and gun type tactics as we move and shoot at the same time. 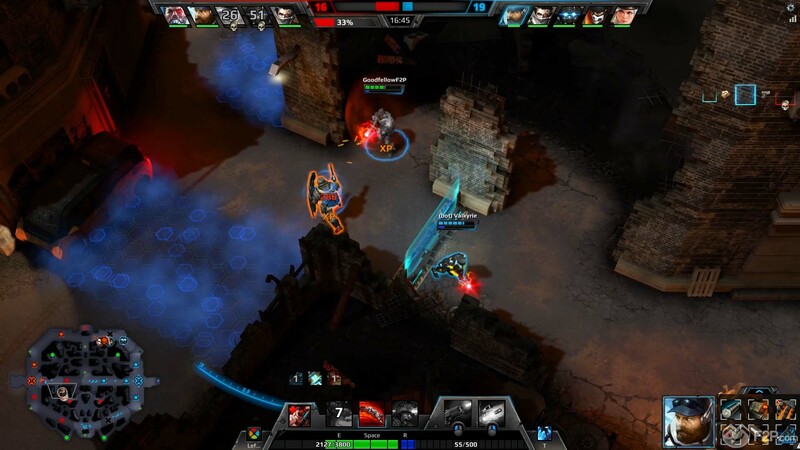 The map is divided into classic three lanes, each lane dotted with both enemy and allied turrets that players must push through with the accompanying waves of drones, all very similar to other MOBA games, allowing for that familiarity of the game and making it easier to pick up and play. There are other sub objectives within the map revolving around accessing other control points, though we didn’t really come to learn what they were about, only from previously reading about the game seems to revolve around upgrading drones. Combat seemed relatively balanced and, in all honesty, as a relative newbie to the genre and the game itself we actually didn’t do too bad and got our fair share of kills, showing how easy the game is to get into. The 10 available Sentinels all seem pretty cool from the overview, divided into three different roles (Attacker, Tank and Support) giving the typical Trinity for combat. One of the things we did like was the Team Levels, with each success the team has be it killing a player, destroying turrets or a variety of actions, these actions benefit the team as a whole and periodically the entire team levels up giving you access to your next Loadout tier. 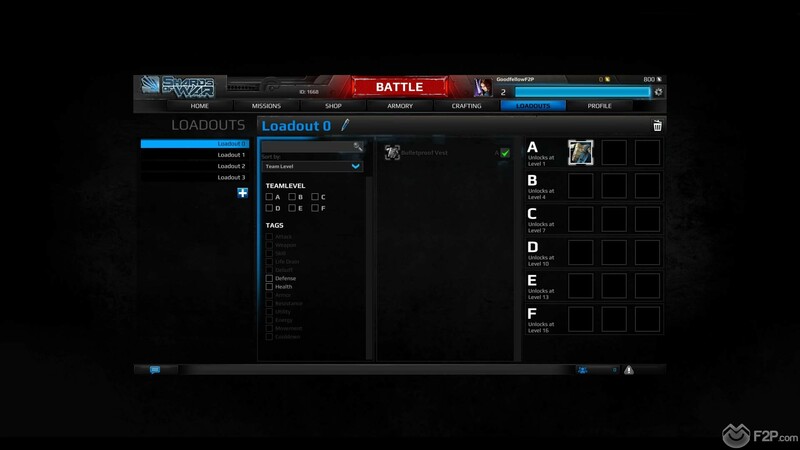 The Loadout is a players customised items and gear that they take into battle, for each Team Level players have three different level of items that they can equip (e.g. you can put three A Grade items into your Team Level A slot, which are the weakest items, but couldn’t put F Grade gear, the strongest items, into the Team Level A slots). As your Team levels up you gain access to your better gear as opposed to purchasing items in game and upgrading them, players know what items they will have access to the moment there Team Level increases. 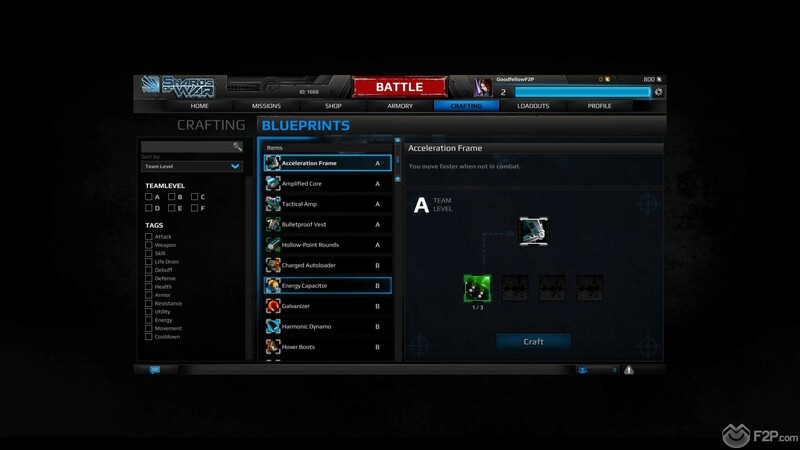 Players world typically fill their Load out with items that they have crafted from the materials are earned in War Chests items gained after each battle that give random materials used to create gear, collecting different components until they have enough to make an item of a certain Grade. Players will have the chance of buying new War Chests through the in game Shop, requiring Gold premium currency to buy, as well as new skins for the available Sentinels, or alternatively purchase a membership gives a few different bonuses such as increased XP, the chance to re-role your War Chest, skin vouchers and other benefits.